The spirit behind Cosmograce and Kaalvastuis R.C.Srivastava, is a triple Graduate in the discipline of Science, Ayurveda and Communication Engineering. Based out of Agra, the historic city adjacent to Mathura and Vrindavan,the birth place and playground of Lord Krishna. He setup this venture after his retirement as Assistant General Manager from Dept. Of Telecom, Government of India. He belongs to “Vaishnava lineage” and had been a disciple of OSHO and Swami Bhoomanand ji, of the pious stream of great Yogis from the Himalayas. His SPRITUAL GURU was Swami Bhoomanand ji Avadhoot,who took voluntary Samadhi on Maha Shiv- Ratri , a pious day of Hindus in India. You can consult Mr. R C Srivastava benefit from his experience. He has been an active contributor to various Yahoo group from 2002 till date [ about last 16 years.] He has been offering predictions, remedies and explaining concepts to members on these groups. This is testimony in itself as anyone can google the existing and old yahoo groups to confirm. Remedies use techniques in Yoga, Tantra, Vedic astrology Yantra and Mantra etc. He shares insight of working of these ancient techniques with modern psychological understanding. 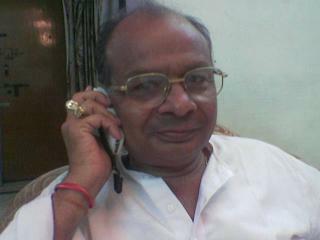 He is practicing Vedic Astrology since 1972 as an amateur. He has offered several methods based on tantra, mantra, prayer and yoga that he has experimented since long to help people. He has conducted workshops on varga, career, birth chart correction in few cities that have been appreciated by participants from time to time. May cosmos bless all with its benefic energy. We do not present our self as GODMAN or one capable of treating the disease by supernatural power nor we invite people to deposit money directly into account in order to solve problems of people. All action designated here as “astrological consultations” is not against scientific temper and rationality,asadvisesare offered after carefully judging pros and cons on basis of logic stated in scriptures. Any donations received or charges paid are compensation for time and effort involved there in.Payee should understand and agree that activities on this web, or its follow-up are not misuse of Religion and spirituality.